Sadly its more than just that one. If we have to call this off(and we aren’t right now) it will be for safety. People have started sharing our pick up and drop off info. We have some children coming. We don’t need them throwing glass beer bottles at us. 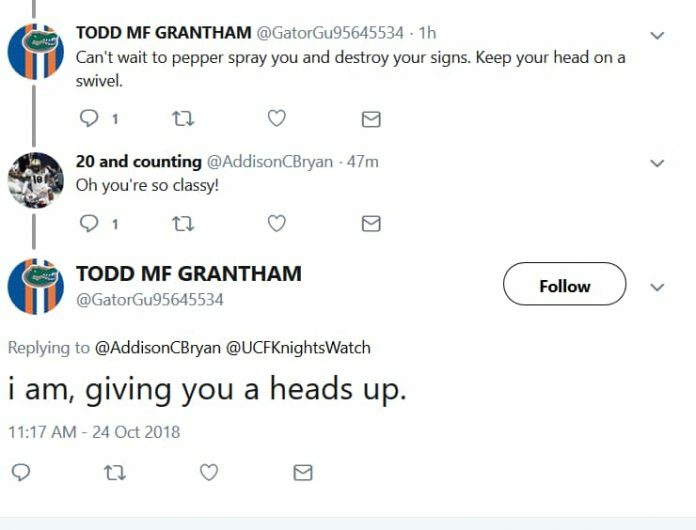 Event organizer and Orlando lawyer Chad Barr pulled the plug on the trip Thursday after viewing the threats made toward them online and then speaking with the UCF Jacksonville Alumni Chapter, as some attendees planned to bring their children. “The Jacksonville Alumni Chapter strongly suggested we reconsider. And they know their city better than us,” Charles, who also helped to organize the event, said to Knight News. It’s with great sadness that we announce the cancellation of the buses to Jacksonville. We appreciate UCF for their support of this adventure. We want to thank all the people who signed up to go. Most of all we want to thank all the UCF students, fans and alumni who generously gave enough money for 2 buses in the last 3 days. The UCF community is strong and united and we found this out first hand. 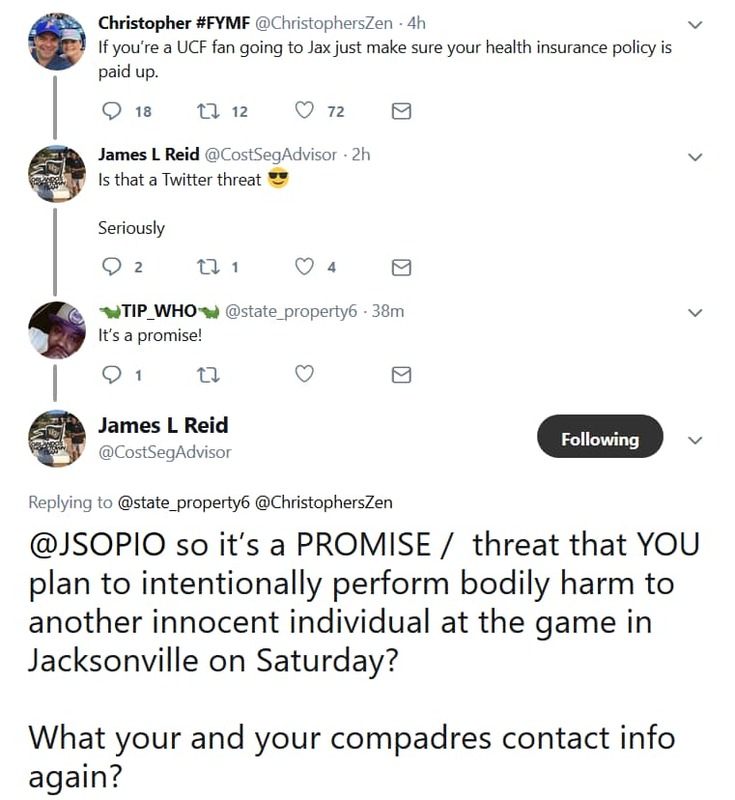 When we started this, the intention was to have fun with fellow Knights on a trip to remember while respectfully showing up to Gameday to promote the UCF brand. We believe in what Danny White has said and we were going to support him and UCF. When we planned this, we expected some to support us, some to scoff and some to tease us, but in the last few days we have seen the ugly side of college sports. A select few of the fans of the teams represented in Jacksonville have openly and credibly threatened to meet us, pepper spray, throw glass beer bottles, steal flags, steal signs and overall physically attack us on sight. We have also been advised by local Jacksonville residents and authorities that there is some risk associated with being in this area both during the wee hours of the morning and based on the size of crowds that attend this event. We have looked into security but the cost is prohibitive for the 12-14 hour excursion and I simply don’t think its even worth having a security detail for a fun-natured college football excursion. Some might say that these are just “keyboard warriors” and not to take them seriously but we have older folks and small children committed to make this trek. It simply is not worth it. I want to be clear that those select few that have threatened to harm us or wish ill will towards us because we dare to enter their “territory” to represent our beloved school on a national television show do not represent all the fans of those teams, nor those 2 schools, but we must still be vigilant, protect our own, and err on the side of caution. For those that donated, we will promptly refund your money. There will still be people coming up as well as people from the Jacksonville alumni group, but unfortunately, it won’t be organized by us. To anyone still going, we know you will represent UCF well.